Dr. Cherry teaches courses in New College and the Department of Biological Sciences. Like her research, the majority of her classes cover interactions among organisms, including humans, and their environment. Principles of Biology II is a survey of organismal diversity, form, and function — including prokaryotes, fungi, plants, and animals. The overarching themes of the course are the ecological and evolutionary relationships among living things, emphasizing both the unique characteristics that different organisms possess and universal biological principles. The course is divided into three parts: I) Single-Celled Organisms, Fungi, and Plants; II) Animals; and III) Ecology. Principle of Biology II satisfies a core curriculum requirement for Biology Majors. 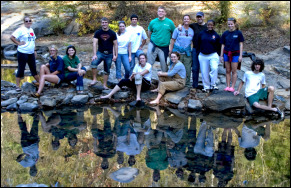 This course is designed to introduce students to the diverse field of wetland ecology, including aspects of hydrology, biogeochemistry, ecology, management, and restoration. The course combines lectures and readings on background material with discussions of scientific literature. Topics to be covered include wetland hydrology, biogeochemistry, plant adaptations for growth in wetland soils, reproductive adaptations of wetland plants, habitat and plant zonation in wetlands, and the role of plants and animals in the functioning of wetland ecosystems. In addition, comparisons among different wetland ecosystems (e.g., coastal marshes, swamps, and riparian wetlands) are made. This introductory course is required for all New College students within their first two semesters in New College. It aims to help students understand the opportunities provided by New College, and exposes them to interdisciplinary, integrative forms of inquiry. Students read about the idea of interdisciplinarity, and engage in integrative projects, small group work, and class discussions. In keeping with the hands-on, experiential, and individualized nature of New College, this gateway course emphasizes active and collaborative learning wherever possible. This seminar demonstrates how laboratory and field research play an essential role in the understanding and advancement of science. Several multidisciplinary experiments and exercises are performed in an effort to increase scientific literacy and to provide knowledge for addressing the scientific basis of real-world problems. Examples of assignments include laboratory write-ups, student presentations, and discussions of scientific topics. Readings are taken from a variety of sources providing fundamental scientific knowledge on topics related to laboratory exercises, as well as books about the history and practice of science. This course includes a substantial field component. This experiential seminar explores the natural history and ecology of our waterways, and examines the human dimensions of control and management of water, including policies and regulations to support environmental and human uses. Through readings, discussions, films, and field trips, we explore the natural beauty and diversity of our aquatic ecosystems, and the ways in which we interact with our environment, both positively and negatively. In addition, we examine current threats and impacts that development, pollution, and management have on our waterways, and consider policies designed to regulate or mitigate these impacts. This course includes field trips, some of which may occur outside of the regularly scheduled class period. This seminar is designed to introduce students to the scientific body of evidence surrounding climate change so that they can evaluate arguments for and against global warming and climate-related issues. In addition to the science, this seminar examines public perception and coverage of the topic in the media. Resources are taken from a variety of sources including the Intergovernmental Panel on Climate Change (IPCC), scholarly articles, popular magazines and other media outlets, and fictional accounts of climate change from movies and novels. Writing proficiency is required for a passing grade in this course. The Senior Project, completed by all New College students in their senior year, gives students the opportunity to put into practice interdisciplinary and integrative methods of scholarship while integrating and refining their knowledge of their depth study area. Projects must result in a piece of interdisciplinary writing and a twenty minute oral presentation at the New College Senior Research Symposium, and may include other components as well. NEW 495 also includes a mentoring component wherein the seniors work with the incoming students in New College.